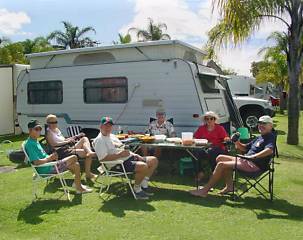 Caravan Parks and Holiday Parks: north coast NSW Northern Rivers; Byron Bay, Tweed Heads, caravan parks, Ballina, Brunswick Heads, Tweed Coast, far North Coast holiday parks, New South Wales, and Gold Coast area, Australia. New South Wales, southern Gold Coast and Gold Coast hinterland of Queensland, Australia. Australian caravan parks are also called tourist parks or holiday parks (motor camps or RV parks to North American visitors) depending on the level of facilities and accommodations offered. Most parks provide facilities suitable for the whole family, with almost all having a swimming pool, childrens playground, and providing a campers kitchen. Additional facilities may include a kiosk/general store, tennis court/s, games room, kids club during school holidays, and an on-site restaurant or bistro. You'll find traditional style caravan parks offering permanent caravans and modest budget cabins, but mainly providing powered and unpowered sites for suitable for tents, caravans, camper-trailers, camper vans and motor homes. Some parks also provide space for 5th wheelers (see also public reserves). Other parks,(holiday parks or tourist parks) provide on-site accomodation ranging "glamping" safari style tents, through to resort style deluxe luxury villas offering all the "mod cons". Tariff shown is indicative only (per night/off peak). Family owned caravan park with spacious sites suitable for tents, caravans, campers, small RVs and 5th wheelers only. Choose from powered and unpowered sites, grass or double concrete slab. Some also drive through. Amenities block with plenty of hot water available. 300m to Tweed Regional Gallery and Margaret Olley Art Centre, and 2km to CBD. Pet friendly (dogs on leash). Overnight, weekly and longer term holiday stays available. $20 pn unpowered, $30 pn powered sites for 2 people. Book selected holiday parks and caravans parks below via Booking.com* or search for more options. Great family park located on Shaws Bay Lake, all accommodation is air-conditioned with a private bathroom, and kitchenette or a full kitchen. Choose from studio economy cabins for couples, and deluxe 2 and 3 bedroom cabins with bunk beds, for 6-8 people. Swimming pool, BBQ facilities, games room, children's playground, mini golf, fitness centre, guest lounge and guest laundry. Directly on the Brunswick River, Ferry Reserve park offers air-conditioned, 2 bedroom cabins for 4-5 people, with fully equipped kitchens, dining and lounge room, and patio. An array of activities, including fishing and kayaking, can be enjoyed on site or in the surrounding area. Facilities include on-site boat ramp, water sports equipment, guest laundry and free WiFi. 2 km from the town centre and the beautiful beaches of Byron Bay, Discovery Parks - Byron Bay offers self-contained cabins, which are spread around its lush grounds by the creek. This holiday park includes two outdoor swimming pools, a water park with slides and a full tennis court. Choosed from studio style open plan cabins suitable for couples and families, sleeping from 2-5 people. All cabins have ensuite bathroom and a kitchenette. Bed linen is included. Facilities include garden, BBQ facilities and guest laundry. Nestled between the pristine Hastings Point beach, national parks and a safe tidal estuary, accommodation ranges from five star, fully self-contained luxury poolside spa villas and spacious family cabins, to comfy chalets for two, all set amidst 10 hectares of landscaped, tropical gardens. Free WiFi, cafe/restaurant, spa and wellness centre, hairdressing salon, sauna, fitness centre, camp kitchen, BBQ, games room, children's playground, kids club, swimming park, disabled facilities. Choose from studio cabins, and 1 and 2 bedroom cabins, suitable for couples and families. All accommodation is air-conditioned, with fully equipped kitchens and en-suite bathrooms. Landscaped gardens, communal lounge with a small library and internet access, luggage storage, outdoor pool, library, children's playground, BBQ facilities, kiosk, guest laundry. Walk across the road to a swimming beach and enjoy a range of water sport activities including windsurfing and fishing. Accommodation includes cabins with shared bathroom, and self contained air conditioned cabins and 2 bedroom family villas with full kitchens and ensuite bathrooms. Facilities include free WiFi, camp kitchen, mini market, laundry, tour desk. Budget cabins fitted with a double bed and 4 bunks which gives family friendly accommodation for up to 6 people. All cabins have reverse cycle air conditioning and are equipped with TV, crockery, cutlery, cooking facilities, microwave, fridge / freezer and private shower and toilet. Free WiFi, BBQ facilities, laundry. Pets are allowed on request. Charges may apply. Air-conditioned cabins and 2 bedroom family villas, with double beds and bunk beds feature outdoor seating area and a kitchenette. Daily bird feeding show, tour desk, games room, children's playground, camp kitchen, BBQ facilities, outdoor swimming pool, free WiFi, luggage storage, laundry. These free listings are provided to ensure the most comprehensive local directory possible. When you contact folks listed here, please mention you found them via Big Volcano. Thanks.